The animals and plants of Great Britain closely resemble those of the Continent but they are not so numerous in species. For example, our islands possess only half the number of species of mammals found in Germany. To understand this it is necessary to go back in thought to a time when Great Britain formed part of a broad peninsula projecting from the north-west of Europe, and when the North Sea and English Channel were monotonous plains. At that time the climate was warm, and this country was just as rich in plants and animals as the rest of the Continent. Gradually the climate became arctic in severity, and the whole of the north-west of Europe became like Greenland, covered with snowfields and glaciers. All forms of life were forced to seek a haven in the more genial south. During this period the peninsula became partially submerged in the sea and consequently many of those plants and animals which still lingered immediately south of Ireland and England were also driven away. Eventually the climate improved, the snowfields and glaciers retired to the uplands, retaining those forms of life that haunted their fringes. Thus it came about that many types peculiar to our mountain regions found their present home. Meanwhile the animals and plants in the south slowly spread back again over the north-west of Europe and began to find their way across the narrow connection then left between our islands and the Continent. But long before they had all returned so far, even this connection was lost. Since then it has never been restored for any great length of time, and consequently the British Isles have never been completely restocked. It must not be imagined that immigration ceased with these conditions. The winds and birds still bring seeds and drop them here. Some of these seeds find a suitable habitat and become established. But the main factor in the introduction of species is man, who has been constantly bringing in fresh species. To him this country owes the importation of domestic animals and the food plants—wheat, potatoes, etc., and a number of stray plants accidentally introduced with commercial produce from other lands. In Nottinghamshire there are 854 recorded species of wild plants. This is only half the number recorded for the whole of Great Britain. This small proportion is due largely to the inland position of the county and to the absence of uplands. In the adjoining counties there are extensive areas of limestone, the soil of which is peculiarly favourable to the growth of plants. In this county the richest flora, which includes such forms as the columbine, rock rose (Helianthemum), and bladder campion (Silene cucubalus), is found on the Magnesian Limestone, but this occupies only eight per cent. of the county. This area is also the richest in land snails, which of course require calcareous material for their shells. Lime-loving plants, however, are not confined to the outcrop of the limestone, for some lime exists in the Keuper marls and Lias. Hence such plants as wood anemone, giant bell-flower, herb paris (Paris quadrafolia), and autumnal gentian (Gentiana amarella), are widely diffused through the county. Side by side with these occur clay-loving forms like the butterfly orchid (Habenaria chioroleuca), meadow geranium (G. pratense),and primrose. Typical Bunter Country: bracken, gorse and woodland. Birches in Birkland, Sherwood Forest: bracken undergrowth. The outcrop of the Bunter, which is three times as extensive as that of the Magnesian Limestone, is characterised by the poorness of its flora. The soil is so coarse that it does not draw up the water from below, nor does its surface hold much of that which falls upon it. The plants it bears, therefore, are such as prefer a dry and sandy situation, such as gorse, ling, heath, broom and hare’s-foot (Trifolium arvense). Lime-loving plants do not thrive upon it. 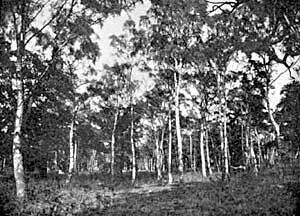 It is on the Bunter that open commons and wastes, such as Bulwell Forest, occur, and furnish a suitable home for the common lizard, slow-worm, and viper. On it also is Sherwood Forest, with its oaks and birches and monotonous undergrowth of bracken. 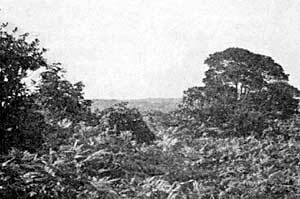 Formerly the forest was much more extensive than it is now and so was its fauna. Before the Norman invasion it was the common hunting-ground of all. After that it became the favourite preserve of kings and ecclesiastics. In those days the red deer, wolf, and badger were common. Now the forest has become restricted and enclosed. The wolf, wild boar, and wild cat have become extinct. Red deer persist in a domesticated condition only on the great estates. The badger still roams at night. Even now, however, many kinds of birds and insects ‘find a suitable home here. The modern hunter is still rewarded from time to time by finding some obscure insect, spider, or similar creature which has never been recorded before for the county or possibly even for Britain. Another asset to the Natural History of the county is the Trent. Its flood plain provides a home for sand-loving, clay-loving and moisture-loving plants ; whilst its waters are rich in many kinds of snails, bivalves, and fishes. Sturgeon have been caught close to Nottingham. Porpoises and seals are occasional visitors and flounders are common in its tidal reaches. Lampern are still abundant. In the immediate neighbourhood of Nottingham the Nottingham catchfly (Silene nutans) existed until quite recently in great abundance on the Castle walls and rock. The Meadows also were carpeted with crocuses within the recollection of the older inhabitants, but now their place is almost entirely taken by houses and their memory preserved in the names of streets. The draining of marshy land accounts for the scarcity or extinction of the sundew (Drosera), butterwort (Pinguicula vulgaris), and buckbean (Menyanthes trifoliata). On the other hand the importation of cereals and linseed from abroad has led to the introduction of other plants, e.g. bur parsley (Caucalis daucoides), and corn speedwell (Veronica Tournefortii), and various clovers and grasses, some of which have become vexatious weeds.